This is the second of five die varieties minted and also second most common. This lovely Mint-State example is from the famous Louis Eliasberg Collection, much earlier acquired by John H. Clapp from Henry Chapman in 1909. Several Mint-State examples survive. 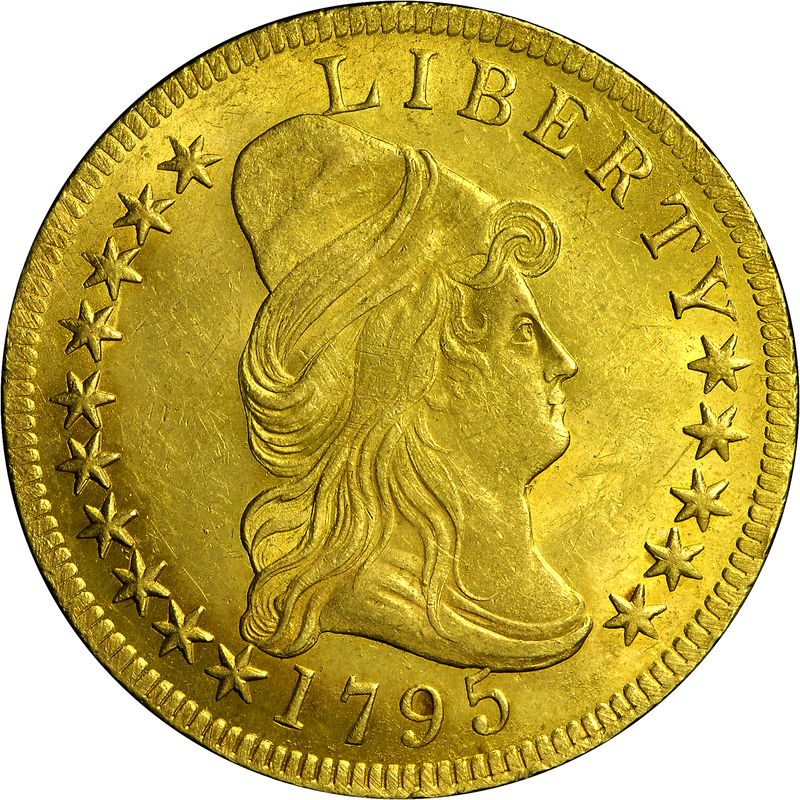 The coin displayed is one of the finer known specimens. 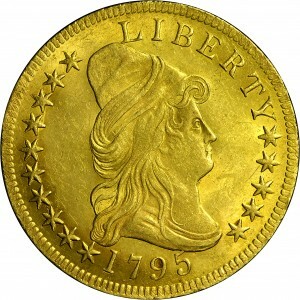 The ten dollar gold coin, or eagle, was specifically named as the unit of gold coinage in the Coinage Act of April 1792. 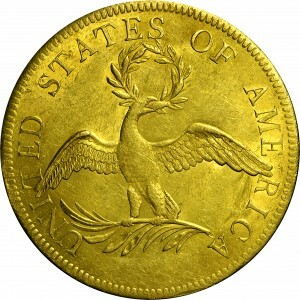 In addition to the eagle, half eagles and quarter eagles were also authorized. 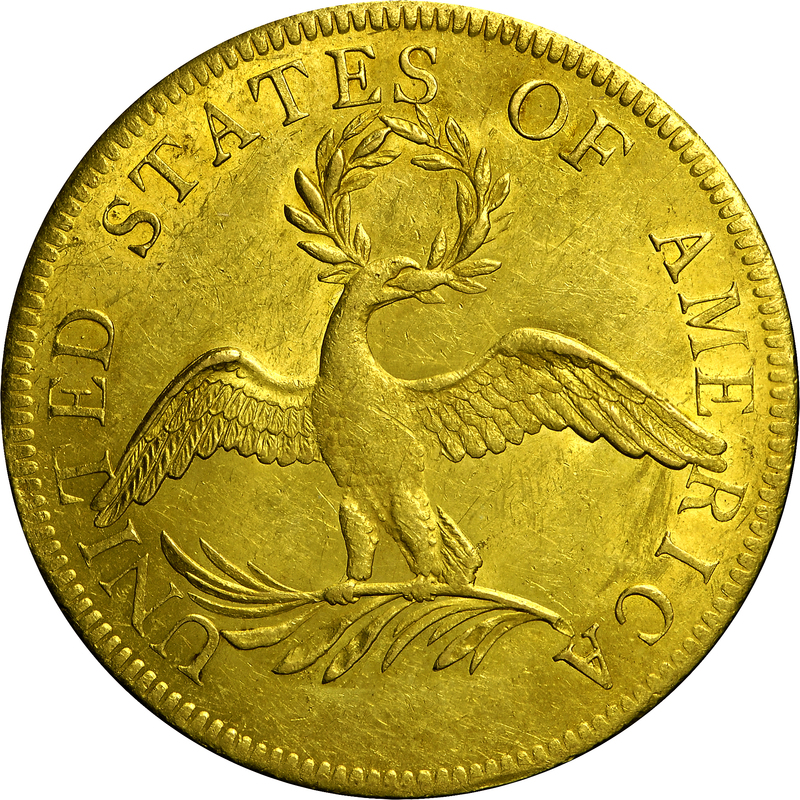 In practice, half eagles were most extensively minted. From the Bowers and Ruddy Galleries sale of the Louis Eliasberg Collection, October 1982, Lot 645. Earlier from Henry Chapman, 1909. "Obverse: Tip of 5 overlain by bust base (distinctive). L touches cap. No stars touch, although many quite close. All stars perfect, having points of uniform length. Point of star 11 not close to Y. Not yet lapped. Reverse: Branch tip centered beneath A, touching neither inside serif (distinctive). Serif of R touches left wing. Palm leaf tip nearly touches U at its left base curve. End of wreath's top right leaf overlain by S, its tip visible within lower opening of S. One lower right outside leaf has hollow interior. Lapped, spaces between palm leaves now wider; space between eagles legs now longer."